CDD-LIVE! 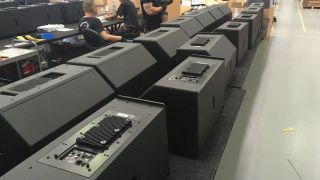 units being prepared for shippingThe What: Martin Audio has started to ship the CDD-LIVE! Series from its British factory. CDD-LIVE! features the company’s patented Coaxial Differential Dispersion technology that delivers class-leading performance, fidelity, coverage and consistency. Each system also incorporates a powerful electronics module, on-board DSP, Class D amplification and Dante digital audio networking with VU-NET compatibility to simplify set-up, enhance control, and eliminate amplifier racks. The Bottom Line: The CDD-LIVE! range is suitable for both live sound and permanent installation applications.